Hitchhike your way to victory! 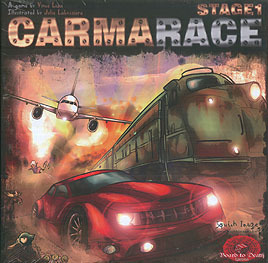 In this fast pace racing game, players will be hitchhiking their way to the convention hall. You'll be using Trains, Planes, and Automobiles. But be careful, make sure you have enough GOOD karma (like a Turbo Charged Engine), or else your opponents will slow you down with BAD karmas (like an Old Lady Crossing the road).